Despite all the jackets I've hoarded over the years, I didn't own a puffer coat previously. My father-in-law graciously gave me a Saks gift card for Christmas and I planned to use it towards a puffer jacket. I unexpectedly have found a trench coat that I've been wanting in March. Getting another pricey jacket in April was definitely out of the question. I put my gift card back in my wallet and waited for Saks second F&F in October. I went to my local Saks late August and tried on a few puffer jackets beforehand. This little number definitely stood out. I bought the size XS and it fits beautifully with a little room for layering. It is quite flattering for a puffer. Measurements of a size XS (laying flat): shoulder-to-shoulder = 15", body length = 24", sleeve length = 21". The fabric is a nice, heavy weight and very well made. I have yet to wear it in the cold so I can't vouch for its warmth. I hope this coat will be sufficient enough for the Midwest winter since I only commute by car. I love that the hood and the belt are removable. The belt placement and sleeve length were perfect on my 5’2” frame The overall length of this jacket sealed the deal for me. It hits me at mid-thigh and doesn't make me feel like I am a walking tent. I also tried on this lightweight puffer but the length was clearly too long on me. 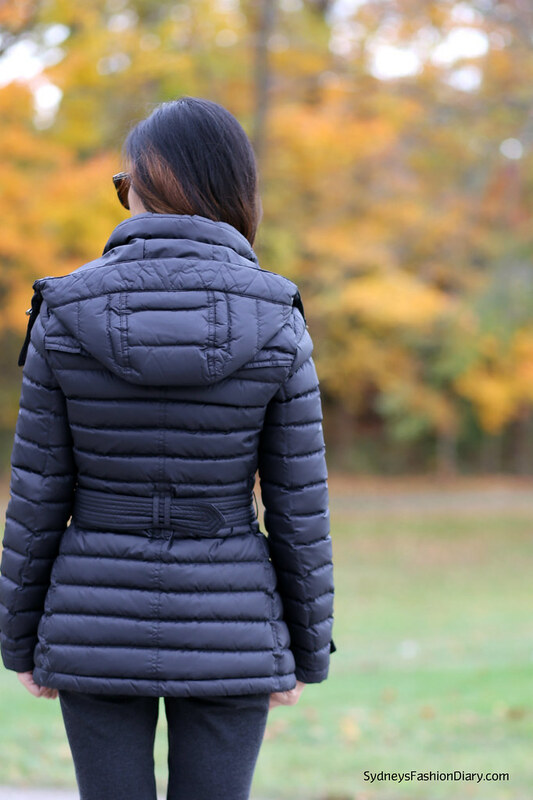 Puffer jackets sometimes tend to swallow a petite frame and this particular one isn't too bulky. I of course do not love the price tag. Unfortunately, we do have to pay extra for the brand name. The coat has a bit of the musty smell from the down fill inside. Hopefully, it’ll go away in a few days. That's an awesome Burberrry piece Sydney!!! @Anonymous I am a size XXS/XS depending on the brand. This coat is fitted on me (size XS) but still allows a bit of layering room. Hi Sydney - Did you have a problem with the puffer smelling like bad goose down? I bought this puffer awhile back and pulled it out recently for the cold but it smells really bad. Wondering if you encountered the same problem and what did you do? Thanks. @Helen Mine did smell bad at first. I let it air out for a few weeks and the smell is gone. One of my friends had the same problem with her down comforter. She ended up putting it in the dryer on low heat with a fabric sheet. Worth a try? Sydney, thank you for your response. Have you wore it in the cold? I am in the market for a new puffer.